arnab baggout shopping Frankly shopping with Arnab! Note- This blog post has been written for Baggout.com. This is a work of fiction and imagination. Last year during the Modern India summit I had an opportunity to meet Mr. Arnab Goswami from the Times Now news channel.Arnab is known for his swashbuckling news delivery style that has amazed many famous personality. 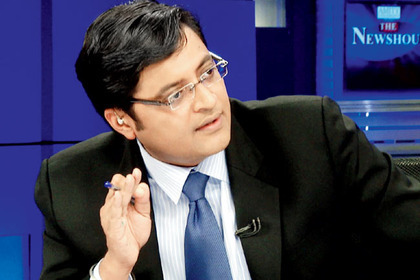 I am a great fan of Arnab and that day I learned a lot about him. I started a conversation with him and soon we turn into good friends. Our friendship had grown so strong that we used to visit each others home for lunch and dinner. Arnab had called me for lunch at his place. I rang the door bell and waited for around 1 minute until Arnab came to welcome me. "Ste,Thank you for coming. Its great to have you here today. I tell you that its a privilege to have you at my home." Arnab said with a smile on his face. This was new to me as I was not used to this avatar of Arnab. "Thanks Arnab," I said, smiling at him. "Have a seat. Make yourself comfortable. Now that this is your first visit to our home, would you like to have a coffee, tea or coldrink?" He asked me as I saw Mrs. Arnab standing next to him. She smiled at me to which I acknowledged her with a smile. I looked around and noticed that it was a spacious apartment room. I asked for a coffee. "I am constantly being reminded time and again that next week is my wife's birthday and I am finding it difficult to go out and buy stuffs for her due to my time constraints." He said with a frown to which I stifled a sigh. "I agree. Popular people like you often find it difficult to make time for their loved ones." I riposted. "Mr. Ste,today I confess to you that I have been a pathetic shopper," he said, displaying an evil grin. I took a sip of the coffee and said, " Well rich journos like you often tend to run behind brands and what they care is about brand and brand values. All that they know about online shopping is Zilch!" "What did you just say, Ste?" he retorted. "Nothing. I don't have the habit of saying things again and again." I replied. "You better tell me what you said about me?" he got furious for once. "I mean I didn't say anything." I replied. I got nervous and continued, " I mean I didn't say anything wrong. I just spoke facts." "Facts? You are accusing me of not knowing anything about online shopping." He said. He was wearing a dapper outfit like the one he used to wear on the Newshour. "Ste, Never ever...ever say such things about a honest online shopper. Just never," he said to which I replied, "Ok!" "Mr Ste, to bring to your knowledge, I know many things about shopping," he added. "I dare you.." he said. "Dare for what?" I replied. "I double dare you. Don't you comment about my shopping skills. Lets debate about the different shopping models in this nation. I will win it," he said. "You have hurt my ego, Ste," he said, slapping his forehead. I looked around for any camera crew's presence. I felt like being a guest on his Newshour TV show. And he was just grilling me like he used to grill Sujay JhaJha on his show. There was deafening silence for a minute. Arnab broke the silence. "Ste, Why are you silent? Are you running out of words or are you reluctant to express your views about shopping?" He questioned me. I was quite sure that I knew many things about him when it came to shopping. "The nation wants to know, Ste. Ste, India demands an answer from you," he said, his tone similar to the one in his TV show Newshour. "Would you stop talking to me as if I am a guest on your TV show. Get back to normal mode, Arnab!" I requested to which Arnab and his wife smiled at each other. "I certainly have to remind myself time and again about my wife's birthday gift. Ste, why don't you suggest me a good shopping website where I can possibly buy the best gift for my wife?" He asked me for suggestions. "Well before that I would like to know your views on a best optimum shopping site," I asked him. "Look gentleman, I believe in versatility. I don't need a place where I could go and search for niche related products. I want all the place at a single platform. That's what I would appreciate!" he said. "That would benefit the end users or the customers and apart from it I need a place where I could discover great products." he replied with a smile. "oh I see," I said, " Go ahead, I'm listening, Arnab." "Of course, a product has to be trustworthy." he said. "How can a product be trustworthy? You mean the retail shop from where the product has been ordered." I said. "Yes! that's what exactly I mean, Ste," he said. "So any product suggested by friends or any other customer should be good enough to give a thought or a consideration. So friend recommendation should be a good to have thing." he said. "Also there should be great facilities in form of Cash backs and coupons." he said, sipping chai. "Well then I have a great place for you." I smiled. "Which place? Ste, do not suggest me something which is redundant and boring. I don't get amused by such so-called places of yours. I need something outstanding and incredible," he asserted. I asked him for his laptop. He swiftly acknowledged my words by handing me his laptop. "w w w dot baggout dot com," I uttered the URL to Arnab which he typed on the address bar on the web browser of his laptop. The page quickly got loaded. It was very much responsive. "Wow!" I got goosebumps when I got such a reaction from Arnab. "This exactly is what I was talking about few while ago, Ste," he said, "Oh look there - a variety of products from different online shops. Flipkarts, Myntra, Amazon, Yebhi, Jabong...oh my .. everything under one roof. I'm elated." I smiled at him as he spoke. He quickly registered in Baggout.com and started exploring it. He virtually strolled through the different sections and asked me many things about it. "Ste, the friend suggestion thing and the trending items list is something I would strongly recommend for the other sites." he said, "And there are hell lot of amazing products." He browsed the lists. He quickly ordered a saree for his wife and he was amazed when he came on the payments page. He almost stumbled down from his chair after he saw the words - cashback and discount. "Cashbacks. Ste, that's one thing of which I am a great advocator," he said. "Yes, they offer cashbacks up to 15% and sometimes even upto 50%." I said and smiled at Arnab. "Why didn't you tell me about this earlier?" he asked me. "Well to be honest, I found it lately." I replied. "If may ask you something. Why are you showing keen enthusiasm in promoting this website?" he asked. I stood there dumbfounded and speechless for a moment. I took a sip of water. It seemed like I was confronted with a question which most politicians had no answer. "Well Arnab..why don't you try this thing there? See it's new and check that product which I had shared." "Mr. Ste, you are trying to avoid my question." he said blatantly. I exhibited a straight face and smiled at him. "The nation wants to know. Ste, India demands an answer." Arnab said. "Yes. I solely represent the nation when I ask questions. So you have to answer me, Mr Ste." Arnab said. I cleared my throat and said, "I am not avoiding your question, Arnab. I support and advocate things which are new and which are amazing. Shouldn't more people know about amazing things on the web. So I chanced upon this shopping discussion to let you unveil something amazing and stunning." I smiled. "Ste, I should be grateful to you for letting me know about baggout. This is my best shopping experience till now. Ste, my dear, you are the greatest friend of mine." he said. Hearing such pleasant words from Arnab gave me wings. I could feel plenty of butterflies fluttering inside my stomach. "Mr. Ste,I want to meet and interview the creative geniuses behind this website and ask them what made them develop this product. It could be the next big thing." Arnab said, exploring the baggout website. "You will get their details on the contact page of the website, Arnab," I said. I got up and shook hands with Arnab. He hugged me and said that this website was the best thing that happened in his life. "Ste, we should meet quite often. Shouldn't you inform me about many new incredible things to me?" he said. "I will definitely , Arnab." I said, "And I am glad that you allowed me to speak today unlike your guests on your TV news channel." I joked to which he laughed. I finally bid adieu to him and left his place. That was one healthy discussion with Arnab. So, that was frankly shopping with Arnab. nice one yr... seriously hw do u get such ideas..??.. gr8!